Shop for heartworm preventatives for dogs at VetDepot.com. Heartworms kill dogs. These spaghetti-like parasites live in the heart and lungs and disrupt the flow of blood around the entire body. Heartworms are transmitted through mosquito bites, and since no form of mosquito prevention is 100% effective, all dogs should be on heartworm prevention. Thankfully, many safe and effective products are now available, but determining which one is right for your dog does take a little research. Dogs over 7 months of age should be tested for heartworm disease before starting any form of heartworm prevention. All of the following pet medications in the table below need to be given monthly to provide the best protection against heartworm disease. Topical, or Spot On, heartworm preventatives use a small amount of liquid that you place directly on your dog's skin. These are similar to topical flea treatments except they are formulated to kill immature heartworms. 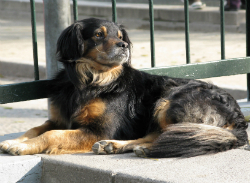 Some of these products, like Advantage Multi or Revolution, are also effective against fleas. Oral heartworm medications are usually available as flavored chewable tablets so they're easy to give to dogs. Many of these products also treat intestinal worms like hookworms and roundworms.